Finally, signs of spring are upon us here at Casa Caldwell. Crocuses (shouldn’t that be croci?) are peeping their sweet little heads up from the ground, as are voles. Both get their sweet little heads removed by the golden retriever as he frolics in the yard. Daisy sinks more into the mud every day and spring sun illuminates the fairy dust of animal hair and dander as it dances through the air of our abode. My sinuses clog up like a southern interstate with a threat of snow and when I sneeze, driving Girl Child home from the barn, she squawks with disgust and cleans her glasses. Spring is certainly in the air. The ghostly voices of my foremothers whisper in my ear. “It is time to spring clean,” they say. “Fresh start. New beginnings. Clean sweep.” Apparently my foremothers speak in clichés and redundancies. My mother innocently mentions that she’s taking all of her curtains down and getting them cleaned. The pressure to live up to my heritage is too much. I must follow in my ancestors’ footsteps. I must spring clean. When I hired a professional organizer to help me some years back, I pretended I wasn’t clinging to my clutter. I needed her approval. She threw all of my master’s degree textbooks into a dumpster. In a dreamlike state, I still see them, in slow motion, arching through the air, their pages of knowledge crying for me to save them. I did not. Their untimely deaths haunt me to this day. This is why my first task of spring cleaning 2015 is to organize the books in our den. One excellent takeaway from the professional organizer was to keep like things together. That is easy with books. Vonnegut with Robbins; Smiley with Tyler; self help with comics. Then it gets touchy. Is Robert Hicks’s Widow of the South with southern history or with local authors I’ve met? Is Cynthia Rylant with children’s authors or in West Virginia writers who rock it, (along with killer authors such as Breece D’J Pancake, Glenn Taylor and Denise Giardina)? As if this weren’t confusing enough, I run across not one, but two fart machines. These are important components of our family culture. They are remote controlled. Battery powered. One can set the speaker part of the machine in another room, under a sofa, perhaps, while commanding the remote from the kitchen. The mark sits down innocently, with clear conscience and bowels, where he considers making moves on girl friend. Suddenly, the explosive eruption that only a Chipotle barbacoa with extra black beans could bring forth rumbles from the sofa cushions. Mission Accomplished: grandchildren averted. 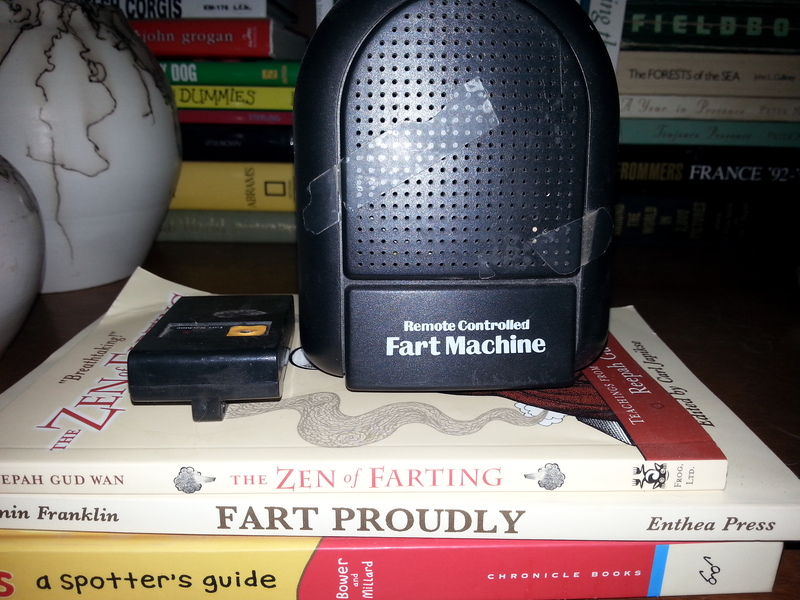 Do I file these important instruments of our household with Benjamin Franklin’s tome Fart Proudly, alongside The Zen of Farting and Farts: A Spotter’s Guide? Or do they reside with the Leprechaun hats and Easter Bunny ears that I put on the car? This, I tell myself, this is why I don’t spring clean like my ancestors did. They didn’t have these problems. Who can take down window treatments and have them cleaned when she can’t even figure out where to put the stinking fart machine? It was so easy for them back then, whacking the hell out of a rug on a clothesline. The confusion and misery introduced by proper fart machine placement brought me to my knees. Forget that version of spring cleaning. Instead of organizing books in the den, I am focusing on completion of other unfinished jobs. Important jobs that demand my attention, such as giving a name to our newest family member, my antique roll top desk. “The desk is Idgie. Fried Green Tomatoes. Tough as nails. Devoted. Best Friend ever. Storyteller. Did I tell you about the ducks in the pond? Bee Charmer. Secret Keeper. Who needs a clean house and organized fart machines when she has friends like this and a fantastic roll top desk named Idgie?